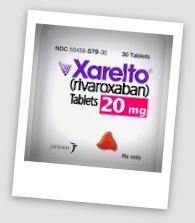 Xarelto (rivaroxaban) is a new anticoagulant drug (blood thinner) made by Bayer and marketed by Johnson & Johnson’s Janssen Pharmaceuticals unit. Xarelto was approved by the FDA in July 2011 to reduce the risk of blood clots, deep vein thrombosis, and pulmonary embolism after knee or hip implant replacement surgery, to reduce strokes in non-valvular atrial fibrillation and to reduce the recurrence of deep vein thrombosis and pulmonary embolism after blood thinner treatment. Unfortunately since its release, Xarelto has been linked to catastrophic bleeding events and wrongful deaths. The drug currently carries two “Black Box Warnings,” the FDA’s most serious type.According to medical experts safety and effectiveness questions remain. Discontinuing Xarelto may increase the risk of dangerous blood clots and stroke in nonvalvular atrial fibrillation users. Having spinal anesthesia, such as an epidural, or a spinal procedure, such as a spinal tap, may cause bleeding on or around the spine that can lead to paralysis. Read the latest developments in Xarelto Personal Injury lawsuits here. Lawsuits allege that drug-makers failed to warn that Xarelto lacks an effective reversal agent, which can make it difficult, if not impossible to stop bleeding in an emergency. Are you looking for a Xarelto Brain Bleed or Gastro-Intestinal Bleeding Attorney in California? Do You Live in San Francisco, Los Angeles, Sacramento, or San Diego, and Want to File a California Xarelto Wrongful Death Bleeding Lawsuit? Xarelto has NO APPROVED ANTIDOTE at this time.